The Most Exciting Parcel; chapter one. This was one of the most exciting parcels I have ever recieved. I knew exactly what was in it, or at least I thought I did. It took me a long time to pluck up the courage to open it. Not because I was dreading it’s contents, quite the opposite, but because I knew that I could only open it for the first time once. What could possibly be so important? I will tell you. When I was a child, I learnt to sew with my Mum. She had bags of scraps I could cut up and ruin, threads and beads and buttons and zips I could experiment with, and some time to teach me. I made my first dolls-house dolls from an English book when I was about twelve I think. I was pleased with them, but felt they were flatter than I wanted and I didn’t know how to make them rounder. When I was fourteen we went to stay with my cousins in Sweden and we visited a doll shop in Stockholm. I clearly remember the beautiful waldorf dolls in that shop, and I really wanted to buy one. But there was no way I could afford one. 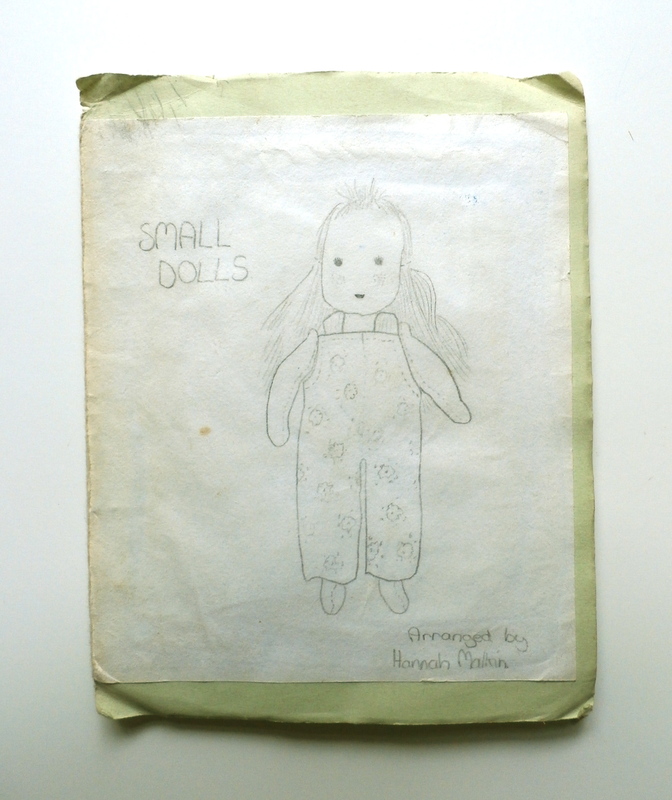 My Auntie is Swedish and she suggested that I buy a pattern book and she would show me how to make a doll – she had the materials needed at home. But which pattern would I choose, the large dolls or the small? Again, I couldn’t afford both. After some negotiations I chose a pattern book for large dolls, and my Auntie bought the corresponding pattern for small dolls, offering to let me copy bits of it. 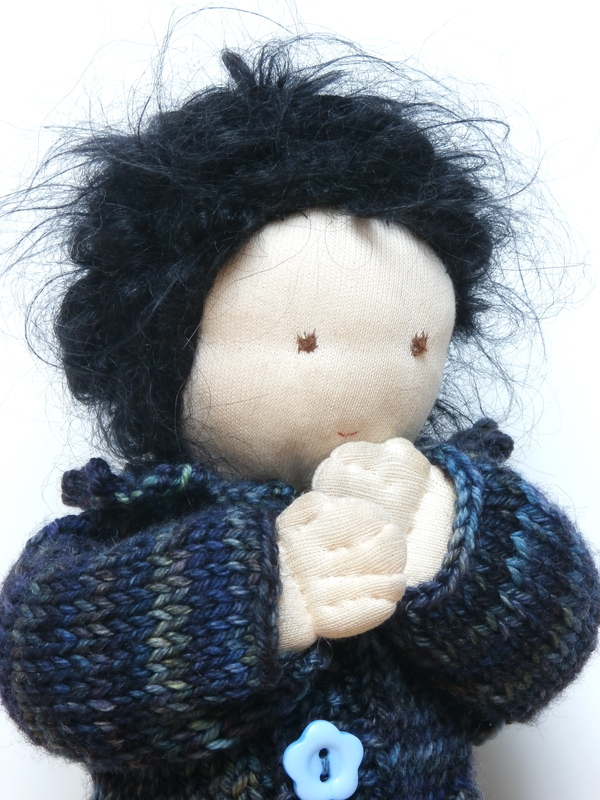 Much of the rest of that holiday I spent sewing with help from my Auntie and my Mum, and I made my first doll. Here she is now, her name is Anwen, and I think she’s standing up fairly well to the tests of time. But how to copy the small pattern book? We did not have a photocopier but we did have paper, so I set about tracing the pictures. I made my own version of the book with as many diagrams as I could copy, since I couldn’t read Swedish so mine would have to be wordless. I drew out the pattern pieces, cut them out and stored them according to size in envelopes that I stuck into the book. I still have this book and use it regularly, writing notes in the spaces and adding my own designs. I believe that both books were written by Karin Neuschutz, but being only fourteen at the time I didn’t think to record any of these details. Throughout my teenage years I used these books to make dolls for myself and for others. the first few I made all had the same hair as that was the only one I knew how to do. Long hair seemed too daunting, and I couldn’t read the instructions that went with the pictures. But I spent so much time pouring over those pictures. It was as though I was trying improve my doll-making by absorbing every inch of every line drawing in the book to make up for my lack of ability with the text. I loved those books, they were like a secret comfort tying me to the familiarity of family and home amidst the crazy changes and challenges of teenage years. 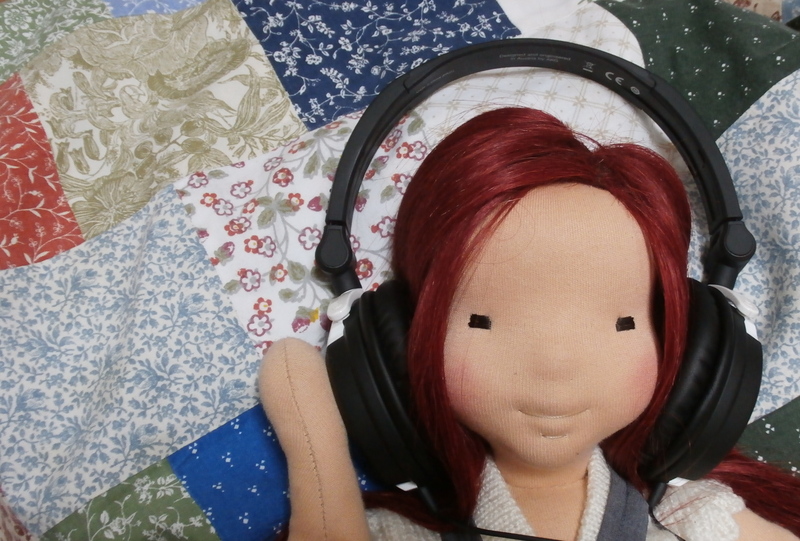 And then one day a friend asked me if she could borrow my large pattern book to make a doll herself. In a bid to share the doll-making love I said yes, and away my precious book went. My first book was Karin Neuschutz’s too, but I bought it two months ago. It changed my life!